This was Duane’s main guitar during the first year of the Allman Brothers Band. 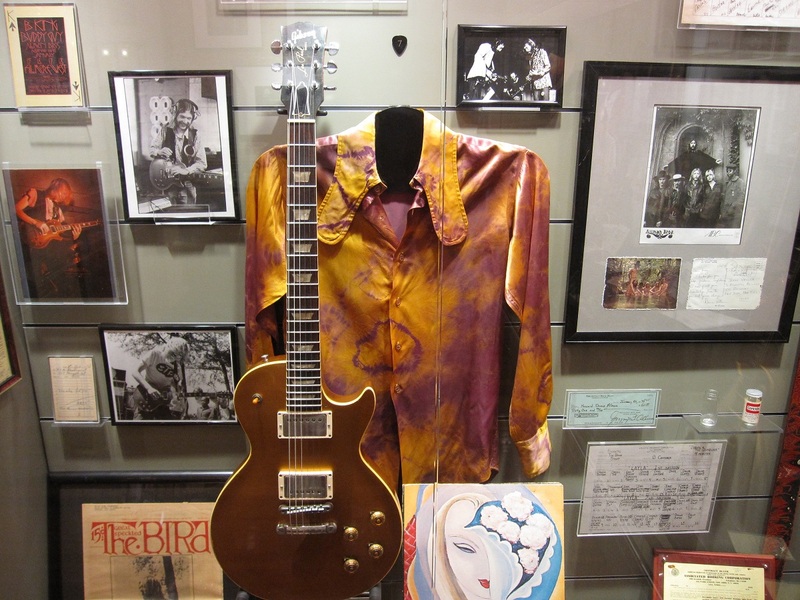 Duane purchased it in early to mid-1969, most likely from Lipham Music Shop in Gainsville, Florida, – which is the place where he and rest of the band often got their instruments at that time. The guitar is first mentioned in a letter featured in Galadrielle’s book [Please Be With Me, p. 182] dated to May 16, 1969. The letter was written by Duane as a reply to Holly Barr, Ralph Barr’s wife (Ralph Barr was guitar player for the Nitty Gritty Dirt Band). In the said letter, Allman mentions buying a Marshall amp, together with a Gibson Les Paul Gold Top and a Gibson Heritage acoustic, but he does not specify the exact date of purchase. This Les Paul featured gold-top finish, two PAF pickups with no covers, no pickguard, and no toggle switch ring (poker chip). What is presumably the same guitar was also seen with this same configuration but featuring pickup covers. These photos all seem to date to early to mid-1969, or the time period when the guitar was still a new acquisition, meaning that it likely featured pickups with covers when it was acquired. Around May 1969 Duane was pictured with this guitar that did not have covers on the pickups anymore, which means that Duane removed them, or had them removed, or these pickups were completely different pickups. The guitar was most likely used on Allman Brothers’ debut album released in 1969, and on the album, Idlewild South released in 1970. It was also probably used by Duane during the Layla sessions with Eric Clapton, as he joined Eric at Criteria Studios in August 1970, weeks before he traded the guitar for the ’59 Cherry Burst Les Paul. There is, of course, the possibility that Duane used his second Goldtop during the Layla sessions since he presumably did have two nearly identical Goldtops at that time (it is possible that the first Goldtop was traded for a Stratocaster). If you happen to come across a photo of Duane taken at the Criteria Studio, which shows which guitar he had with him at the time, please be sure to forward it to us by posting a comment below. Duane kept using the guitar as his main from the time he bought it and until September 1970. On the 16th the Allman Brothers Band played a gig in Daytona Beach, with the opening band called the Stone Balloon. The guitarist of that band, Rick Stine, played a plain top 1959 cherry burst Les Paul, which Duane admired. He ended up making a deal with Rick and gave him his ’57 Goldtop, $200 in cash, and a 50-watt Marshall head for the burst. The only thing that he kept from the old Goldtop was the PAF pickups. However, based on the info posted on a Duane Allman fan page on Facebook (also available on DuaneAllman.info) Kim said that he recalls taking the guitars to a guitar shop in Decatur, GA for the switch to be made. One thing regarding the story about the pickup swap between the Goldtop and the Rick Stine cherry burst is that the Goldtop had no pickup covers, so it only follows that the cherry burst shouldn’t have them either after the swap took place (in case you’re confused – this guitar served as a donor to a 1959 Gibson Les Paul Standard Cherry Burst that Duane used later on). The cherry-burst Les Paul did however feature pickup covers, as seen on the Fillmore East footage, September 23rd, 1970. One possible theory is that Duane and Rick swapped guitars on the night of September 16th, 1970 at the Daytona Beach, Florida, and then sometime after Kim Payne took the newly acquired cherry burst and Duane’s first Goldtop – a 1950s model which did have pickup covers (more about this guitar here – 1950s Gibson Les Paul Goldtop) – to a guitar shop in Decatur, GA to swap the pickups. After Duane’s death, the guitar changed a couple of hands before ending up with Scot LaMar who restored the guitar to original condition, including the original Goldtop finish, now done by Tom Murphy. Nowadays Scot often loans it to Warren Haynes, Derek Trucks, Vince Gill, and others for live gigs. When not played, it spends most of its time at the Big House Museum in Macon, Georgia, which LaMar agrees is the place it belongs to.